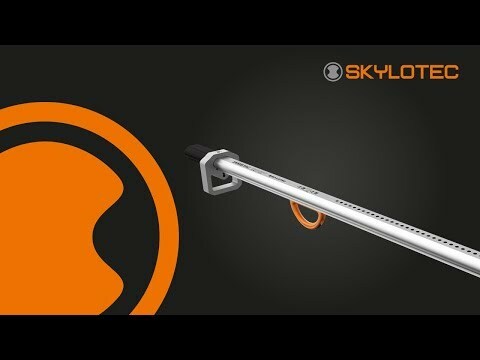 With its Claw Line steel cable fall-arrest system, SKYLOTEC offers a new solution for fall protection on ladders. The system can easily be installed on existing structures or on ladders. It can also be adjusted flexibly to suit specific on-site requirements. The Claw Line is certified according to the latest EN 353-1:2014+A1:2017 standard and approved for stainless steel cables with a diameter of 8 mm. Along with the associated innovative Claw cable runner users can permanently climb safely up and down the fall-arrest system. Servicing or maintenance workers use permanent fall-arrest installations to protect themselves from a dangerous fall. This is the case, for example, for those working in telecommunications, on power masts, energy supplies, wind turbines, high-bay storage or on enclosed access ladders in the wastewater industry. 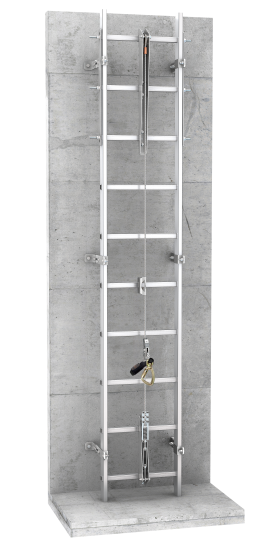 With the Claw Line, SKYLOTEC now offers a latest state-of-the-art steel cable fall-arrest system with an 8 mm stainless steel cable for vertical ascent and descent using ladders. The system is based on a stainless steel cable guide; easily traversable intermediate brackets fix the cable and prevent any disruptive displacements. This makes it possible for workers to climb safely up or down to their place of work. The Claw Line can be installed on existing structures or attached straight onto a ladder. The system is available in three basic versions, each of which needs only a small number of basic elements. Each version has a stainless steel cable, intermediate supports and a tensioning element. This makes it easier to plan the installation. The various versions can also be combined with one another flexibly as required – as can the upper and lower anchor points. This makes it possible, for example, to choose a ladder anchor point at the bottom and a structural anchor point at the ceiling or the other way around. This leads to a wide variety of configuration options compared with previous systems. The Claw Line can therefore be adapted easily to suit the specific on-site requirements. The individual components are also packaged efficiently in small pack sizes so that they can easily be transported to the place of installation. An additional benefit is that the modular system is easy to understand and practically self-explanatory. This makes it easy to install. The top end of the stainless steel cable is always fully assembled and clamped onto a grommet. At the bottom end, it is completely enclosed by the tensioning element. This significantly reduces the risk of injuring hands by gripping open strands during installation, as well as during subsequent use. For installation on aluminium ladders, the top three rungs are also reinforced by threaded rods and counter plates. For each potential system version, the same tensioning element is installed to achieve the required tension of 80 kg. This is achieved simply by rotating the turnbuckle. When it comes to safety, the tensioning element offers an additional advantage: the laser marking indicates at all times whether the adequate tension still exists. This means that users can carry out a visual check to see whether they can still attach themselves to the Claw Line or whether they need to retighten the tensioning element first. The SKYLOTEC Claw Line steel cable fall-arrest system can also be installed on existing structures using a structural anchor point. The basic elements of the Claw Line can be combined with one another flexibly as required. For example, the entire system can be installed on a ladder. Compared with previous solutions, the fall-arrest system also offers another advantage: it is made exclusively from stainless steel and is corrosion resistant. This also makes the Claw Line ideal for use in the salt water atmosphere of the offshore, near shore and onshore sectors, as well as in water supplies and sewage disposal. 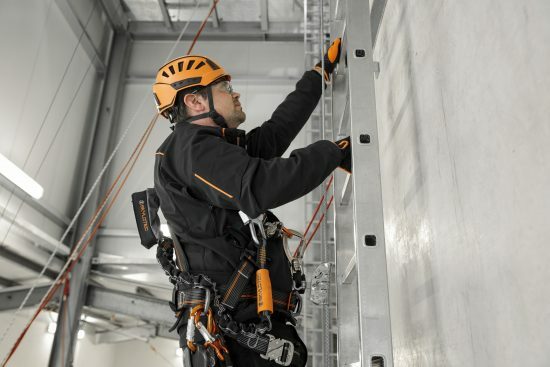 The steel cable fall-arrest system is EN 353-1:2014+A1:2017 certified. A maximum of three people can attach themselves at the same time. The Claw Line fall-arrest system can be used in combination with the SKYLOTEC Claw cable runner. This boasts features that enable simplified application and reduce the risk of an accident. For instance, the runner is secured directly in a number of ways to prevent incorrect use in error. In addition, the brake shoe opens with a light tug on the carabiner, while the runner follows the user up or down without manual intervention. This makes climbing practically effortless. The cable runner in combination with the Claw Line is certified in accordance with EN 353-1:2014+A1:2017 as guided type fall arresters including a rigid anchor line. It secures a maximum of one person weighing from 50 to 150 kg.